I first saw the hummingbird as I was moving furniture on the screened porch. He was a bedraggled clump of feathers no larger than a cotton ball, slumped on the floor, wings spread. He had clearly been trapped in the porch after having flown in the open door, and had worn himself out flying against the screen. I felt responsible because the day before, I’d left the door open while cleaning. It was a sad irony that the little bird had flown thousands of miles from Central America on his migration, only to die on a screened porch in North Carolina. Since I thought he was dead, I scooped him up to carry him outside. But somehow he didn’t feel dead in my hand. He moved slightly, and began to give out occasional faint cheeps. He was still alive! But he was limp, and his feathers were tattered from thrashing against the screen. I also knew he was dying because during summer hummingbirds only store enough energy to survive overnight, and this one had likely been in the porch for much longer, wearing himself out futilely trying to escape. I thought he might have a chance to survive if I set him on a feeder. So I brought him upstairs and tried to position him with his claws gripping a perch and his beak inserted into the plastic flower. So all he had to do was extend his tongue to feed. It wasn’t easy getting him positioned because he weighed almost nothing and was so tiny. I dropped him several times, and as he hit the floor, I hoped I hadn’t injured him further. I finally maneuvered him into a stable position and left him to go inside and get the camera. But when I looked through the window, I saw that he had somehow dislodged himself and was hanging upside down from the perch, clinging to it with a single claw. I repositioned him several times, only to see him work loose, but still hang on to the perch, literally for dear life. I had to do something else. He needed to be in a position to feed without having to grip a perch. So I placed him on the porch railing and found a pink milk bottle top, filled it with nectar, and held it against his beak. Maybe the pink color would induce him to feed. Then, to give him more elevation, I placed him on a jar top so he could feed downward at a natural angle. All the time, I was buzzed by the cloud of dozens of impatient hummingbirds who come to the feeders. 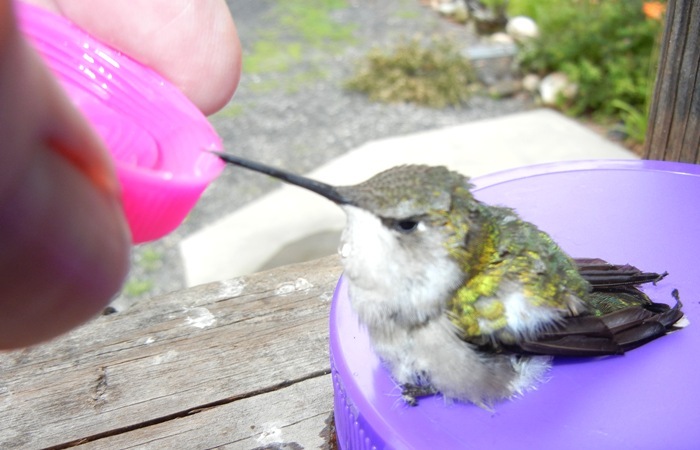 One even swooped down to investigate the bottle top, hovering by my hand as I tried to get the little hummingbird to feed. Bees and wasps also buzzed me, but I held my ground. I realized my other hand was cramping because I was unconsciously gripping the porch post so hard. The hummingbird still didn’t respond. His breathing was indiscernible, and only an occasional slight movement told me he was still alive. I persisted, keeping his beak in contact with the nectar. Then after fifteen minutes or so, he opened his beak slightly. He’d tasted the nectar! I waited, keeping his beak in the liquid. He began to open his beak more often. Then I saw a subtle telltale movement in the nectar. He’d begun to flick out a tiny translucent tongue slimmer than a thread. Over the next minutes, his feeding grew more frequent, the tongue extending farther into the nectar. I could tell his breathing was growing stronger, because the iridescent green feathers on his back began to rapidly rise and fall. He moved his head slightly, another sign he was reviving. Since he was gaining strength, I took the chance to shoot a photo, holding the camera in one hand and the bottle cap in the other. I continued to feed him, determined to stay until he either revived enough to test his wings, or finally died. I bent down to see whether his eyes were open, but they remained closed. Maybe he had been too far gone after all. The bottle cap needed more nectar, so I turned away to get the nectar jar. And whoosh! He was gone! I caught only a glimpse of a feathered streak sailing away into the distance.